Coordinated by the San Francisco Interfaith Council, this parade/march will start at 11:00am at 4th and Townsend and end at the Yerba Buena Gardens. There, the 8th Annual Interfaith Commemoration Ceremony will commence, featuring religious leaders, including CIPL Steering Committee member, G.L. Hodge. Monday, January 15, 2018 is Martin Luther King Jr. Day—a federal holiday marking the Reverend’s birthday. This upcoming weekend is a perfect chance for Americans to honor Dr. King’s legacy through acts of service and community building. Organizing for Action (OFA) Marin is encouraging volunteers to use the long holiday weekend as an opportunity to serve their communities in wonderful events taking place here in Marin. Be sure to register when requested for all events. For locations and times, . Just Sustainability: Religion, Pluralism, and Care for Our Common Home"
There are multiple benefits of electric vehicles: ditching oil, cleaning the air, spending less to maintain your vehicle, and protecting Creation! But what you may not know is that owning an EV is getting simpler and more cost effective all the time. Rebates for electric vehicles, a growing number of charging stations, and creative ways of buying new or pre-owned EVs are making EVs more accessible and practical. This webinar will address all the issues above plus provide information on how your congregation can install an EV Charging Station. Questions? Contact Allis at allis@interfaithpower.org. The California Endowment's Oakland Conference Center, in Downton Oakland, CA. Why Should Californians Attend This Unique Conference? From high levels of Adverse Childhood Experiences (ACEs), to job and financial struggles, racism and other forms of inequity and injustice, traumatic stress is epidemic today. Climate change will aggravate all of these existing adversities, and add many new ones as well. Yet, California is leading the U.S. in finding innovative new ways to address personal, family, and community traumas--and on reducing carbon emissions. This conference will show how, by breaking down silos and connecting these issues, California can also lead the nation in building widespread levels of individual and psycho-social-spiritual resilience that prevents harmful human reactions to the hardships generated by rising temperatures while advancing social equity and motivating people to reduce carbon emissions. The Rev. Sally Bingham will be a speaker at this important event. The California Public Utilities Commission is due to vote on February 8 on Draft Resolution E-4907, a move that would put burdensome requirements on existing and new Community Choice Aggregations (CCA's.) CCA's are an excellent way for whole counties or regions to adopt more renewable energy and they need to be strengthened and expanded not impeded unduly. Thursday, February 8 - come to the rally and stay for the CPUC meeting to provide a public comment. More information, talking points and other ways to become involved are outline here. If you do attend, send a picture and short statement to Allis Druffel at allis@interfaithpower.org. We want to see the faith community in action on this important issue. 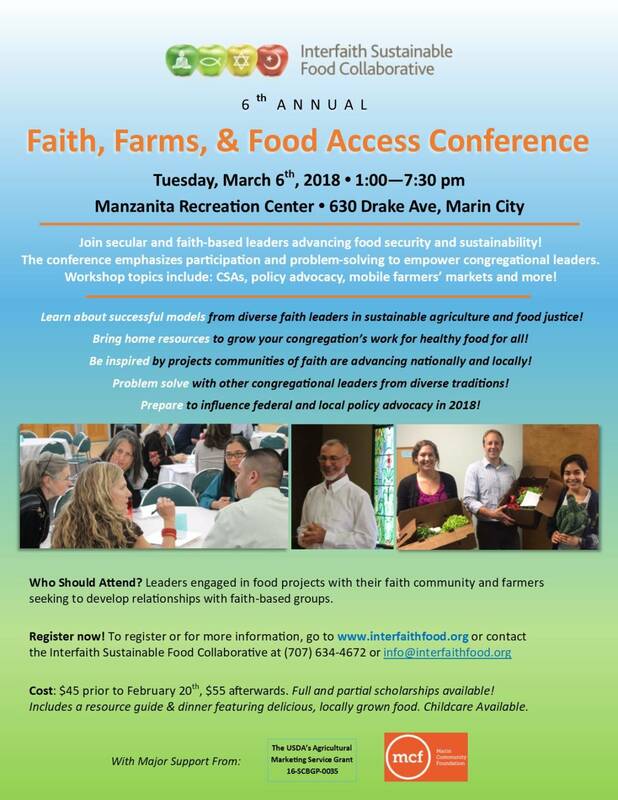 Join secular and faith-based leaders advancing food security and sustainability. The conference emphasizes participation and problem-solving to empower congregational leaders. Workshop topics include: policy advocacy, mobile farmers' markets, Community-Supported-Agriculture (CSA's) and more. Featuring CIPL Steering Committee member Rev. Dr. Carroll Ambrose, and CIPL Executive Director Susan Stephenson. 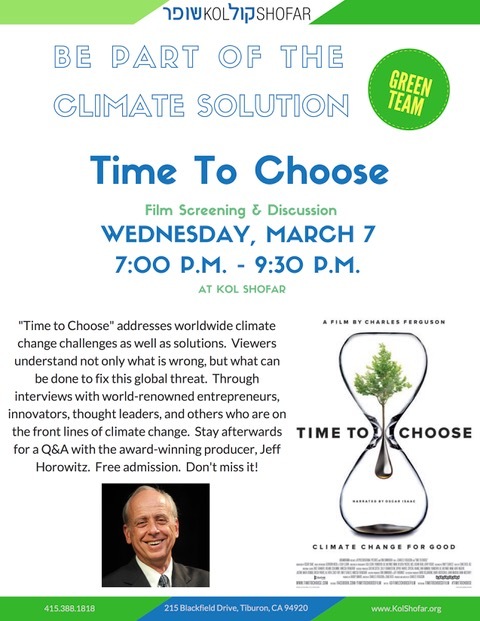 Award-winning producer and environmental activist Jeff Horowitz will show his film "Time to Choose" at 7 p.m, Wed., March 7, at Congregation Kol Shofar, 215 Blackfield Dr., Tiburon. Interviews with world-renowned entrepreneurs, innovators and others on the front lines of climate change issues address ways of dealing with the urgent crisis in new and important ways. After the showing of the 2016 film, Horowitz, who has served as a speaker and moderator at major international climate change and conservation conferences, will be available to answer questions. The event is sponsored by the Green Team of Kol Shofar, and is free and open to the public. explore how much energy will be required to create the renewable infrastructure we need for tomorrow — and steps in planning for this shift. Climate change disproportionately affects women, especially women in the Global South, women of color, and women in poor communities. In addition, recent research shows that environmental practices are considered emasculating to men. Together in this one-day conference, we explore the various ways that gender intersects with the field of religion and ecology. Forum presentations by two distinguished JPL scientists will examine patterns and causes of increasing atmospheric CO2 concentrations and the effects of rising global temperatures on sea level rise. New knowledge about the effects of global temperature rise can make an important contribution to planning future global climate-change policy. Featuring Annmarie Eldering and Ian Fenty. Event is free and open to the public. For more information, go here. Sponsored by League of Women Voters, supporters include California Interfaith Power & Light. Come celebrate Earth Month at SFIC's monthy breakfast. Enjoy a continental breakfast and meditation with Faith Stephen Kyriacou, Dean of Annunciation Greek Orthodox Cathedral. Debbie Raphael with the San Francisco Department of the Environment will present on her work and a faith journey by CIPL's new president, Rev. Susan Guy, will round out this special event. All are welcome. Click here for a cool animated flyer of the event! There will be a host of booths for food, education, and fun. For more information, contact Allis at (310) 752-3436. Please join us Earth day weekend on Saturday, April 21st, 1:30PM at First UU Church of SD in Hillcrest for an Intergenerational Weekend Celebration: A Reunion of Science and Religion with Scripps climate scientist V. Ramanathan, and theologian John Cobb Jr who will dialogue together in the afternoon. The program includes interactive music with the MLK community choir, giant rod puppets, and ritual. Suggested donation $10. Child care available 1:30 to 4:30. The Sikh community will gift us with an Indian vegetarian dinner, representing “the equality and oneness of all humankind.” Please RSVP for the 5:30PM free dinner and dancing here. Hillcrest UU Church is at 4190 Front St., San Diego, CA 92103. 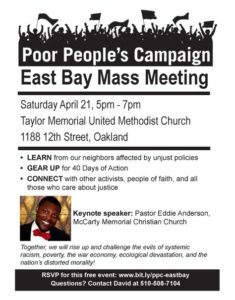 With keynote speaker, Pastor Eddie Anderson of McCarty Memorial Christian Church, this event will focus on education and action from those who deeply care about racism, poverty, the war economy, and ecological devastation. The Bishop of California and longtime climate activist on the We Are Still In movement and climate action as prayer at This Forum event. Throughout the week various congregations will celebrate walking, biking and taking transit to their place of worship. Congregations may sign up and choose which day they wish to participate and promote to members of their organization. We invite and encourage all places of worship to participate. When you sign up you will receive a free Walk & Bike to Worship packet of materials to help with your event. "Reinventing Power: America's Renewable Energy Boom"
Reinventing Power: America's Clean Energy Boom takes us across the country to hear directly from the people making our clean energy future achievable. These individuals are working to rebuild what's broken, rethink what's possible, and revitalize communities. Over the film's 50 minutes, you and your guests will meet people in eight states whose lives were changed by the renewable energy industry while exploring various aspects of the clean energy industry from innovation to installation. The FREE special screening of Reinventing Power: America's Clean Energy Boom will start with a cocktail hour at 6:30 p.m., allowing guests to mingle before the screening begins at 7:15 p.m. The evening will close with a panel discussion on clean energy. Address: Ahrya Fine Arts Theater, 8556 Wilshire Blvd., Beverly Hills, 90211. To see a trailer, get more info, and to RSVP, click here. The premiere of a new work by celebrated composer Richard Festinger performed by the award-winning Telegraph Quartet. This new chamber music composition, Icarus in Flight, tracks three human drivers of climate change - land-use change, population growth, and fossil fuel use - across 200 years to spark novel insight and to viscerally communicate the urgency of action. The evening will include an introduction by Dr. William Collins, Director of the Climate and Ecological Sciences Division at Lawrence Berkeley National Lab, an opportunity for public engagement, and a closing reception. Buy tickets here. CIPL is preparing for its second legislative advocacy day of the year on August 14. Faith advocates will stand up for their shared religious principles of the protection of life, public health, and the right to clean clean air and water. We will keep you informed of our plans for this. In the meantime, if you'd like to attend, please contact Allis Druffel at allis@interfaithpower.org for more information. Gather with others looking to ground themselves in advance of the march. Gather with others excited to celebrate the Sabbath, the Jewish day of rest and grounding. Gather with other members of faith communities for an opening prayer. We will proceed from the meeting place to a gathering place along the march route. On September 8th, across the United States and the World, we will take to the streets to demand climate action from our leaders. Join us in California's march, hosted in San Francisco. Meet just south of the stage in Embarcadero Center - look for faith banners and an egret puppet. 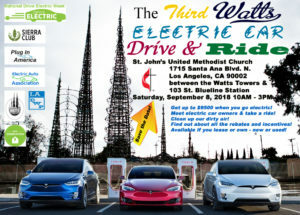 Hosted by St. John's United Methodist Church, this event will showcase the latest electric vehicles, give attendees a chance to test drive them, and provide information on rebates and incentives, whether you plan to buy or lease a new or used EV. Find out how YOU can make your next car an affordable EV! 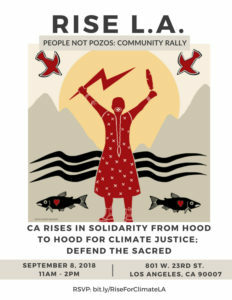 RISE for Climate, Jobs and Justice L.A.
On September 8, the Rise for Climate, Jobs and Justice march will call on elected officials to take aggressive action on climate change, protect frontline communities, and continue clean energy job creation. In particular, we are calling for the permanent shutdown of AllenCo Oil Company; a 2,500 foot human health and safety buffer between oil extraction sites and homes, schools, and parks; and an end to new oil and gas drilling permits in California. We will see you there! More info/RSVP at bit.ly/RiseForClimateLA. We'll bring in the start of the Global Climate Action Summit with song and prayer in a multi-faith service. Tell us you're interested in attending in person or watching the live steam. GCAS Faith-Rooted Affiliated Workshops are designed and led by leaders and experts representing many faiths on Thursday, September 13 and Friday September, 14 at Grace Cathedral. Participants will engage with issues of faith, climate change, local and global action, and learn about environmental praxis from a multi-faith perspective. Preview the current list of workshops and reserve your seat. What is AB 617 and how can it benefit your community? This workshop is intended for any and all who are interested in reducing air pollution within their community, and to learn what programs the State and related agencies are providing. Does having an air monitor in your community and potentially creating a citizen science for your neighborhood or school seem exciting? Do you feel represented at State and agency meetings related to air quality? No matter the question, no matter the answer, this workshop is for you! To register and receive more information, contact Yolanda Park at ypark@ccstockton.org. Hosted by Little Manila, and Catholic Charities Diocese of Stockton. This webinar will highlight examples of domestic and international communities negatively impacted by the extraction of the fossil fuels that cause climate change, with specific examples from Southwestern United States and Peru. We also will consider how to avoid the damage inflicted by the fossil fuel industry, such as human rights abuses and environmental degradation, as we work to shift to a renewable energy future. Hosted by the Catholic Climate Coalition. RSVP here for the webinar. Calling all EV's and Supporters! In response to the proposed rollback of the federal Clean Cars Standards, CIPL will have a Clean Car Showcase and Press Conference designed to enhance the roll that clean cars play in the transition to a cleaner future. We will especially address Ford Motor Company, which is potentially a huge ally in maintaining the Clean Cars Standards. Bring yourself, bring your clean car (EV, hydrogen fuel cell, or plug-in EV), wave a sign and make noise! Who: All are welcome! Seeking at least 15 folks to bring Clean Cars for the showcase and publicity; also seeking folks to hold signs and do chants. Media will be invited to attend.